Back pain is well established as a condition associated with our increasingly sedentary lifestyles. Time spent sitting is strongly associated with back pain incidence. Contrary to what many people may feel, back pain is less prevalent in more manual occupations such as building, construction, or trades work. Rather it is a condition more readily associated with the professional desk bound classes. Why is back pain made worse by sitting? 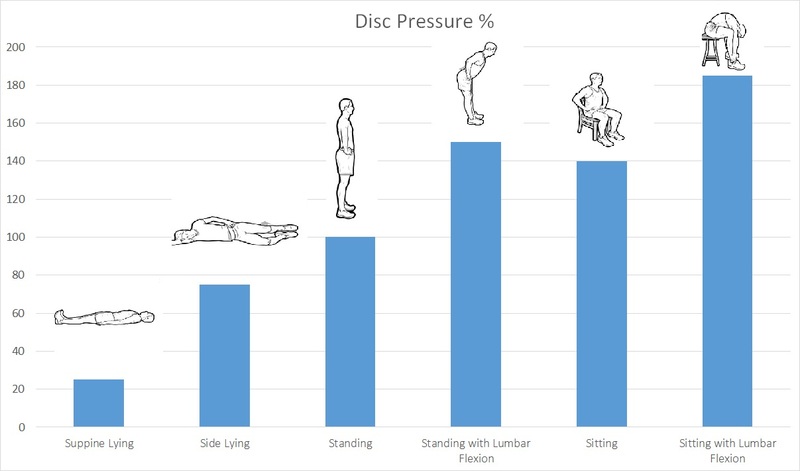 As compared to lying on your back which exerts a pressure through the lumbar discs of only 25% that of standing, sitting exerts 140% as much pressure. We would never consider standing with our spines half flexed for periods at a time as shown in the diagram, but we readily sit for 8-10 hours per day, exerting similar levels of force on our lower backs. If back pain is caused by sitting then what can we do to prevent it? Everybody needs to sit but following our top three tips to avoiding back pain is a good start to ensure that the necessary sitting you do each day does as little damage as possible to your lower back. Limit sitting to 20 – 30 minutes at a time and then take a short 30 second break to stand up and stretch before recommencing your work. Exercising in a structured and scheduled way in the evenings 2-3 times per week for 30 mins to one hour goes a long way towards reversing the damaging effects of poor posture throughout the working day. The type of exercise is not as important as the regularity of it. 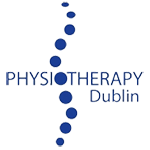 Whether you swim, run, cycle, gym or take part in yoga or pilates classes, regular and consistent attendance is the key to preventing back pain associated with poor work place posture. When you’re tired after work, the easiest way to relax is to zone out and watch your favourite TV programmes. Relaxing as this might be, it further adds to the pressure on your lumbar discs associated with prolonged sitting, and needs to be avoided in the interested in reducing our likelihood of developing lower back pain.